*This experience was sponsored by Enchantment Resort and Mii amo Spa, and we thank them for hosting our family for this fantastic experience. Mii amo Spa at Enchantment Resort in Sedona is legendary. 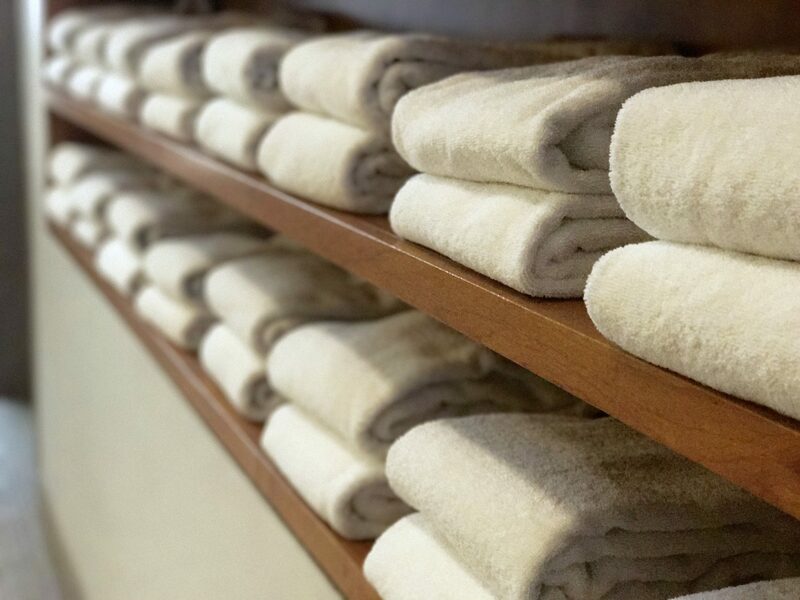 In fact, it has been rated among the top ten destination spas in America by Travel & Leisure, Conde Nast Traveler and Town & Country – oh, just a few simple accolades. 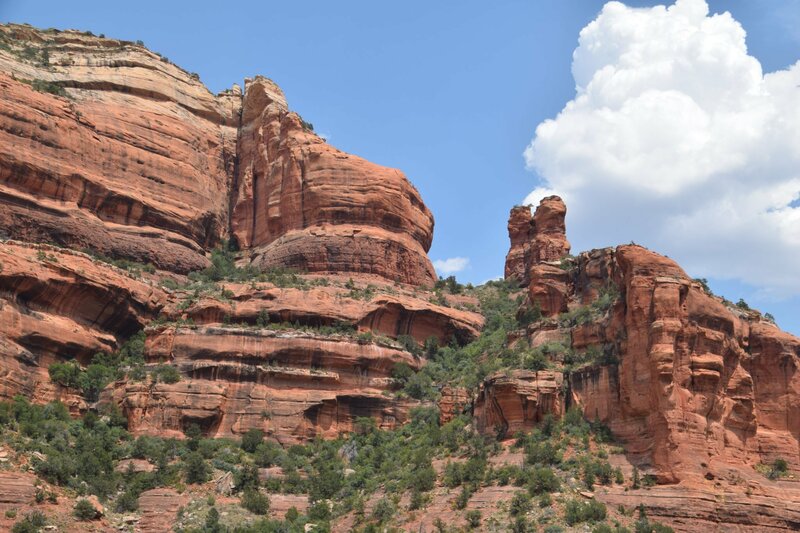 Not only is it nestled into the stunning red rocks (stones) and picture-perfect cliffs that have made Sedona so iconic, but it is seated fortuitously at the entrance to Boynton Canyon. This canyon is the location of one of the world’s strongest energy vortexes, where the earth’s magnetic energies are focused and the source of Native American rituals for centuries. 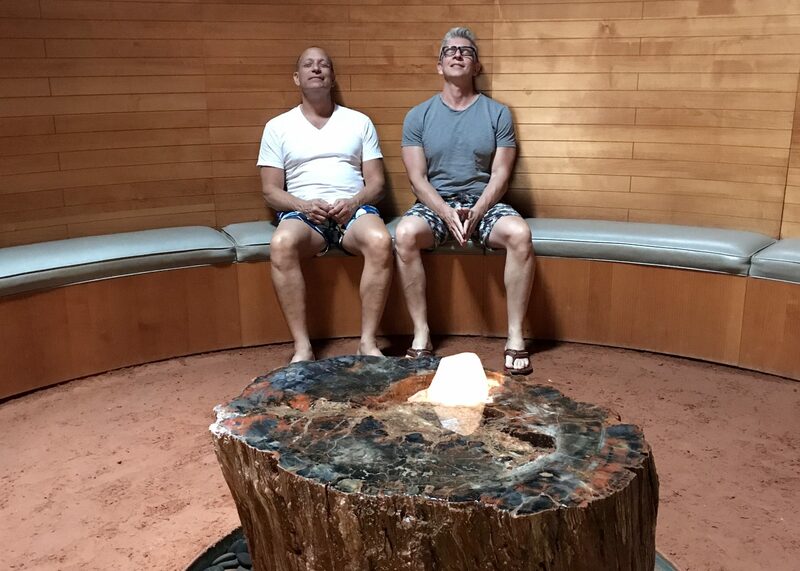 While on a recent road tour of the Great Southwest, we had the pleasure of staying at Enchantment Resort with a special visit to Mii amo Spa. We strolled a short walk down the road from the resort casitas towards the spa, and on the way spied a mule deer and her two fawns nibbling at some grass along the pathway, peacefully unconcerned about us at all. We took this as a very good sign. For more about our visit to Enchantment Resort, visit my blogpost titled Enchanted at the Enchantment Resort & Spa: Sedona. Mii amo is a jewel within a jewel that attracts visitors from around the world to experience its innovative treatments. Being the big spa whores that we are, we just had to schedule appointments at the best of the best. And it was. Best, that is. I think the sign of a very successful spa is when you feel like every person there is dedicated to just you and your well being. 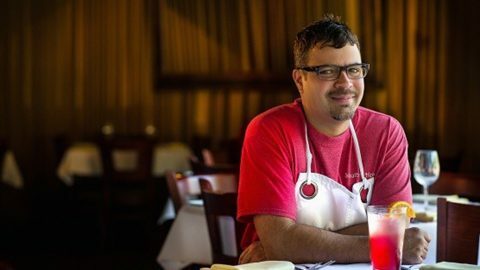 From the time we entered and were greeted, we experienced singular – and I mean singular – service better than anything we had expected. The locker room attendant, the massage therapist, the facialist, the desk attendants – all were exemplary ambassadors of “ahhhhhhh”. We were relaxed and at peace before a single treatment started, and never saw another soul in the building although they were fully booked. That is some fancy scheduling, and we loved it. I’ve had a few hot stones in my day (save your jokes for later) and have always left feeling “meh”. However, there is a reason this massage is a signature at Mii amo – it really is that good. Under the guidance of my masseuse, I melted into a puddle of relaxation. There is something in the combination of very hot stones, which are nestled underneath you at your chakra points, and the very cold stones, with icy punctuation that counterpoints the hot. I’ve never had this treatment – or seen it offered anywhere for that matter – and it was pretty awesome. When I am able to have massages at home, I always opt for deep tissue treatments to ease my tired and aching old carcass of a body. I often leave feeling more sore than I started, and it takes a day or two to settle into relaxed muscles. With Mii amo’s stone massage, my relaxation was immediate and profound. I always appreciate when a spa has a men’s facial on the menu. Triton and I like getting facials once in awhile, and are often bummed if we have to endure treatments which were more designed for a woman. This facial was manly all the way. Well, except maybe for that fruit salad they smeared on my face (not complaining really, because it smelled amazing). My fruit salad included a citrus cleanser, a strawberry serum, a tingling citrus mask, a pineapple scrub (that one was my favorite – I tried to lick my own cheek it smelled so delicious) and a bevy of other natural scents including lavender and eucalyptus. I loved it, and better yet, I looked AMAZING. All buffed, polished and hydrated, I felt like a million bucks. 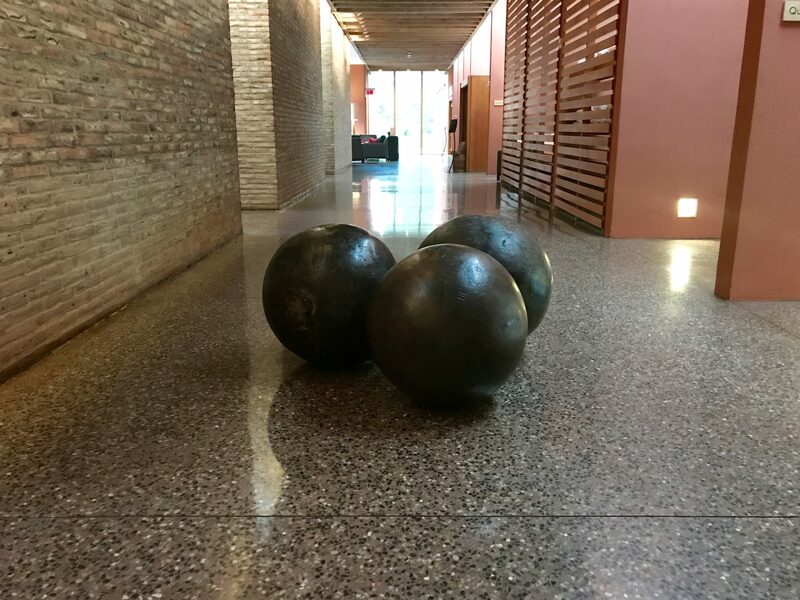 When I was finished and back in the lobby fully clothed, Triton was still in his treatment so I wandered around the cavernous lobby for a bit. Clearly we had not planned this to our optimum benefit because I soon realized we could have spent all day long at Mii amo, checking out the nooks and crannies, sweating out the evil toxins in the hot and cold saunas,sampling their delicious natural juice concoctions, and lounging in the indoor or outdoor pools. As I explored the area I came across a man playing a Native American wind instrument, which I had thought was a recording the spa was playing on their sound system. He was that good, and the perfect accompaniment to this beautiful environment. I immediately gravitated South, where the guide suggested I would experience the fresh and new. It stated this is the direction to appreciate the potential for new learning experiences – to see the miracles and harmony. Hmmm, I will have to think on that some more. That sounds like the title of a good book, “The Crystal Grotto”. However, this book would be about you and only you, because this Crystal Grotto is based on the Native American Kiva, a place of ceremony and transformation. 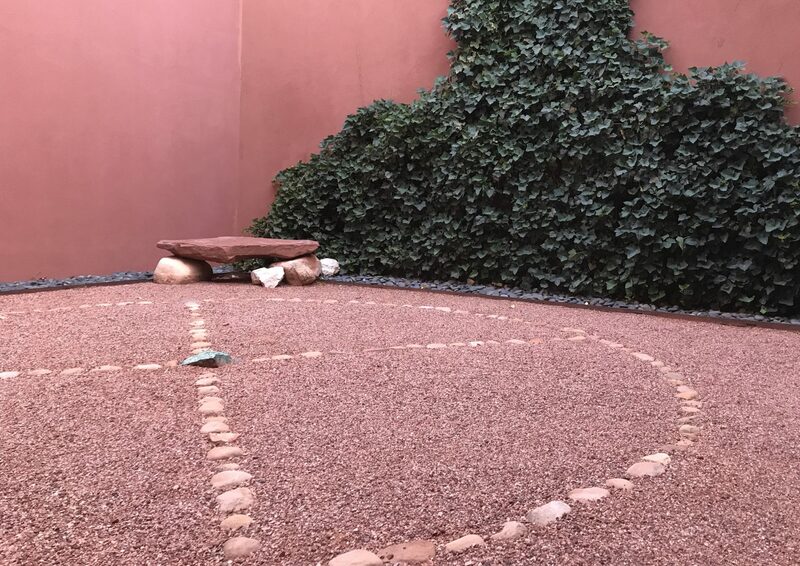 It was a round room, made from the red earth Sedona is so famous for, and carefully created with energizing crystals placed at North, South, East and West. A round skylight in the roof shines directly on an enormous quartz crystal in the center, which we were told lights up in the middle of the room at high noon on the day of Summer Solstice. Darn, we missed it by just one week! 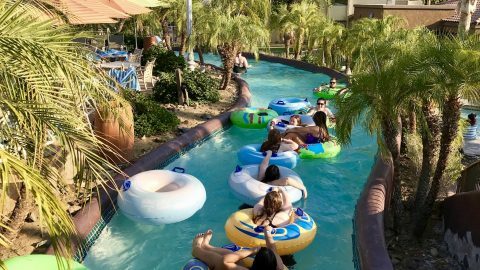 OK, it was very nice of the Enchantment Resort and Mii amo Spa to host a portion of our experiences as part of us writing about our Great Southwest Family Road Trip Adventure. And it worked – we are hooked. Triton and I are already comparing calendars to determine when we can come back. It really was just that special. And no, we did not get stoned. The natural high was exhilarating enough. Excellent ! !what a lovely information with catchy eye words, hats off to your work.Do you include any packages? Thank you! Not sure on packages – we don’t offer them but perhaps Enchantment would!